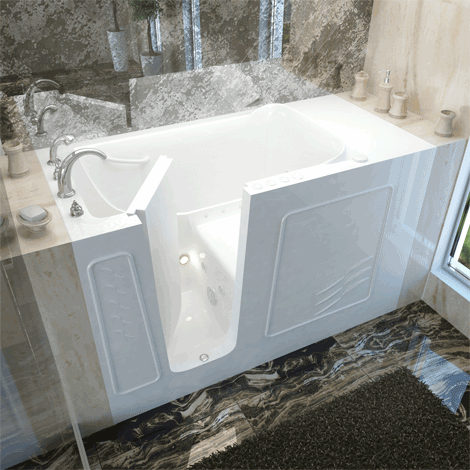 This extra-large walk in bathtub is very spacious and can accommodate a larger bather. With more soaking area you will be sure to enjoy submerging your body into a warm bubble bath. 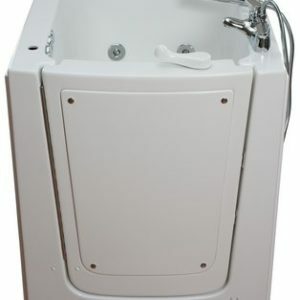 Our Meditubs walk in tubs are skillfully made in the U.S.A. They come with incredible no leak warranties that will give you extra confidence when making this kind of purchase. Do you want Acylic Or Gel Coat? Most walk in baths are going to have a fiberglass foundation. Typically they are coated with either an acrylic or triple gel coat finish. Upon examination it may be hard for someone to tell the difference between the two. Acrylic is typically less porous and has a little shinier sheen to it and easier to clean than gel coat. Gel coat however is more lightweight than its counterpart. We proudly offer walk in tubs and handicap showers with both finishes as an option.